My late father-in-law, Professor Peter Geach, was received into the Church in 1938, in his final year at Balliol. My late mother-in-law, Professor Elizabeth Anscombe, was received into the Church that same year, towards the close of her first year at St Hugh's. 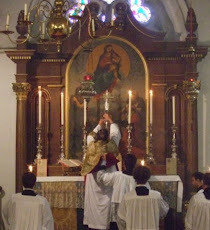 Each received instruction from Fr Richard Kehoe OP, though they did not meet until after their reception into the Church; the meeting occurred on the occasion of the Corpus Christi procession at the then Servite Priory at Begbroke. For an interesting account of Peter Geach's time at Balliol see the obituary by Sir Anthony Kenny in the current Balliol College Record. The real successor to the throne is the Australian Catholic Plantagenet claimant, not some Scottish interloper. Albrecht which one of my countrymen do you refer to.The prince of Finley?? I will be enrolling your late father and mother-in-law as well as Father Kehoe in the Rorate Caeli Purgatorial Society this very day. I heartily recommend the (free) enrollment of souls through the Society. PS I read that your mother-in-law was from the County Limerick. God save Ireland and may she intervene before the Throne of God for us. I certainly intend to return to Munich in the coming year, to pay my respects, at the Wittelsbach crypt in the Theatinerkirche, to His Majesty.